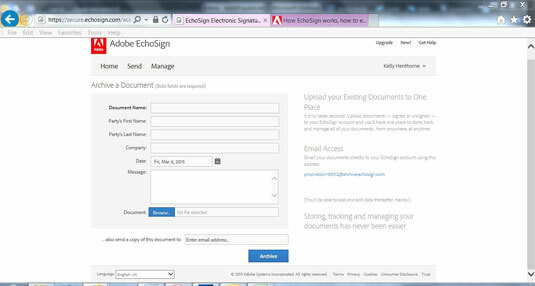 Archive your documents with EchoSign. All documents that you sign or send out for signature are stored automatically (where else but in the cloud). You also receive an encrypted PDF of all signed documents. Because the archives aren’t associated with any one device or hard drive, you have access to your signed documents whenever you need them. You probably have documents that weren’t signed through EchoSign but that you would like to have as part of your archives. You can upload any of your documents through the Archive a Document option. And, you can send a copy to as many people as you’d like through EchoSign as well. Manage and track your documents with EchoSign. On the EchoSign Home screen are some areas that help you manage your documents. If you are interested in the details, select the Manage screen. From this screen, you can quickly identify how many documents you have out for signature, how many you have signed, and even how many documents are archived in your cloud. Send documents for signature directly from Word or PowerPoint. 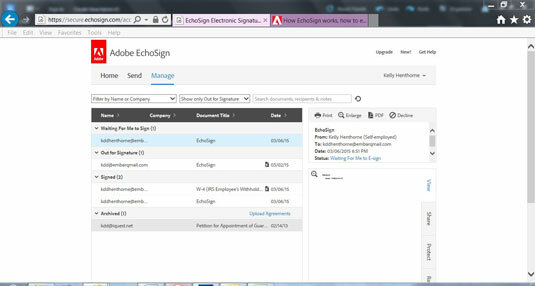 As of January, 2015, EchoSign enables you to send a document directly from Word or PowerPoint for signature. 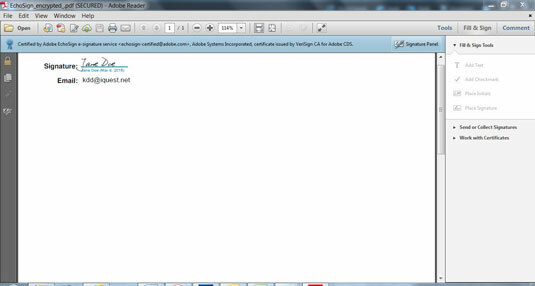 The figure shows the final PDF of a blank Word document that was sent out for signature. You upload the document, and EchoSign takes care of the rest.